From our humble beginnings in the 1920’s, Clyde Hatch originated in Leamington, Ontario. In 2013, the store relocated to Tecumseh, Ontario still maintaining its charm and reputation. When you’re looking for that special outfit or accessory, we want our customer to feel confident that their purchase will provide them with quality, longevity and satisfaction. Clyde Hatch Boutique provides an inviting and elegant atmosphere. Our dedicated staff are focused on making sure our customers look and feel the best they can when shopping at CHB. 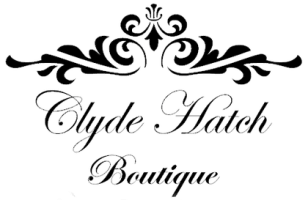 Clyde Hatch Boutique has an extensive selection of quality fashions to suit any occasion. Whether it’s for a casual event, a business function, fun or formal, CHB has you covered. We carry sizes 2 – 18 and alteration service is available. It’s our mission to make your shopping experience memorable, and to make CHB feel like your home away from home. Call us today at 519-979-2828, or stop by our store at 352 Manning Road in Tecumseh, ON. We look forward to meeting you!